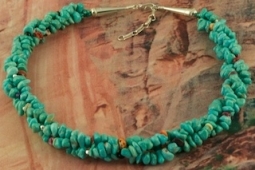 Beautiful Necklace featuring Genuine Sleeping Beauty Turquoise Stones accented with Spiny Oyster Shell. Sterling Silver Cones, Extender and Clasp. Created by Zuni Artist Helen Tsosie. The Sleeping Beauty Turquoise mine is located in Gila County, Arizona. Sleeping Beauty Turquoise mine has recently closed. It is now obtained from private stashes. Necklace is 16" long x 1" wide. The Sterling Silver Extender is 1 1/2".